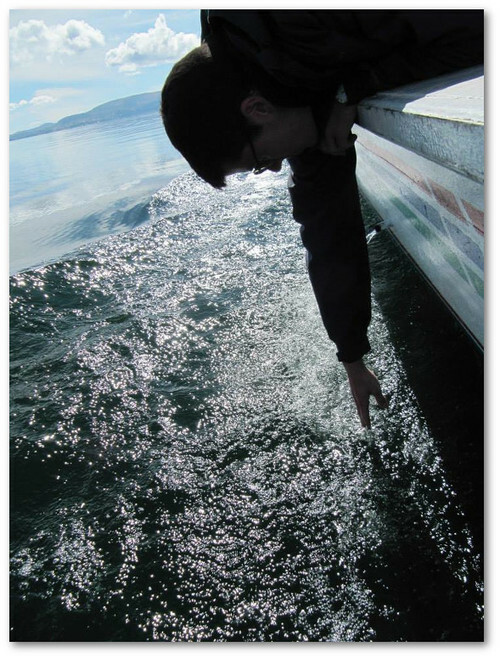 The world’s highest accessible lake - Lake Titicaca. My god, the vastness, the endless breadth of dark waters, distant mountains marking the horizon. We made our way here on a little chug-boat with an upper and back deck. I took my pleasant time dozing in the sun and letting my hand drag through the cold water. We made a stop at Uros, the floating islands, where thousands of reeds bob on top of floating root structures and create a platform large enough for 5 huts and 25 people. I noticed, as we did our plodding, touristic rounds, a young woman, mid-20s perhaps, seated on the spongy ground and dressed in classic Incan style. A small child ran up to her and threw himself wailing into her lap. The woman perfunctorily pulled up her yellow-orange shirt and gave the child a long, full breast. As the child quieted and fed, she looked from the child’s long hair to the water to the ground beside her, and her stare grew infinite there, as if something yawned through the reeds. Her idle stare seemed to chart what writers spend lifetimes after. Her stare charted misery and happiness, charted the end of youth, mapped the sweetness of each person’s time as a child. So now, sitting on the dried-grass slopes of Amantaní, burros and sheep bleating in the turned-up fields, behold the mighty lake. The mighty lake, with clouds that might be mountains and waters never-ending. Somewhere amidst this sun-hardened town, the floating islands, and the wild mountains far away, is the world’s ancient rumble and calm.